Toronto, ON, May 20, 2014 – INKAS® Armored Vehicle Manufacturing is pleased to announce a new armored personnel carrier (APC). INKAS® Huron is a tactical attack and defense vehicle, which is able to protect its passengers in high threat environments within any climate condition. The vehicle is designed and equipped to operate in police and military tactical missions, convoy protection and border control all over the world. INKAS® Armored Vehicle Manufacturing will supply the first four vehicles to the National Police of Colombia. “We are proud to announce a new unique vehicle in the lineup. At INKAS® Armored Vehicle Manufacturing, we know how important it is to provide protection, reliability and mobility along with a high level of comfort to the passengers of an armored personnel carrier in any type of weather condition. Thus, we believe that our customers – police forces, SWAT and other security agencies in Latin America, Africa and all over the world – will see the true value in INKAS® Huron APC,” said Major General David Fraser, Member of the Board of Directors, INKAS® Armored Vehicle Manufacturing. INKAS® Huron is a unique APC in terms of technical specifications, design and assembly. The vehicle is characterized by a high level of maneuverability and is extremely lightweight relative to its size. It incorporates revolutionary lightweight armor which increases its mobility and speed performance in comparison with the other similarly-sized vehicles in the market. INKAS® Huron’s well-proven off-road capabilities are supported by an 8.3L Paccar Engine and a ten-speed manual Allison Transmission. The OEM body of the vehicle was replaced with a fully re-designed body by INKAS® Armored Vehicle Manufacturing that incorporates heat and noise insulation materials providing an unprecedented level of comfort to its occupants. The length of the vehicle as well as other critical characteristics such as a roof-mounted gun turret can be customized in order to meet the requirements of each customer. INKAS® Armored Vehicle Manufacturing facilitates the global delivery of the vehicle to all major seaports as well as it has an ability to arrange airfreight upon special request. INKAS® Huron’s competitive price makes the vehicle accessible for Ministries of Defence, police and other security agencies. INKAS® Armored Vehicle Manufacturing is a leading Canadian-based company that specializes in the design and production of a wide range of armored vehicles, including executive SUVs, luxury sedans, special purpose military vehicles, personnel carriers, cash-in-transit vehicles, and others. 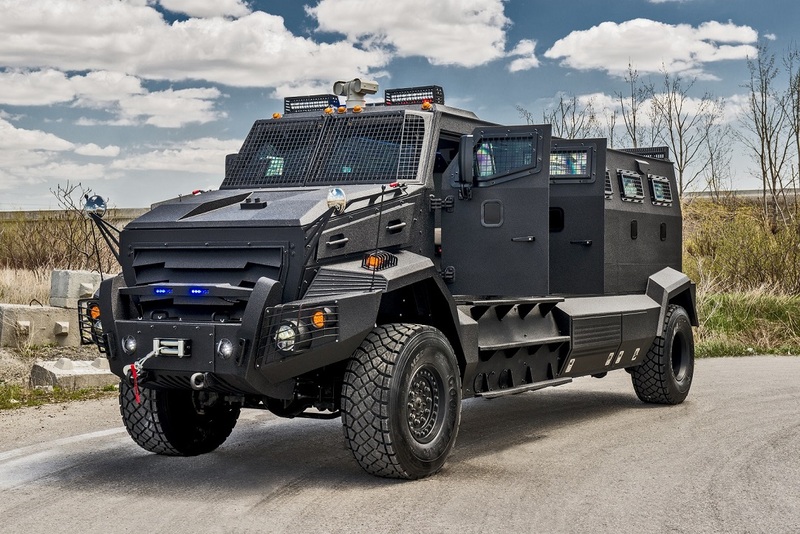 Since 1996, INKAS® Armored Vehicle Manufacturing has been providing armored vehicles for banks, law enforcement agencies, corporate clients and individuals all over the world. Operating from multiple facilities located in Toronto, Canada, and Dubai, UAE, INKAS® Armored Vehicle Manufacturing fulfills all orders, regardless of size, with an individual approach to the needs and requirements of every customer. Company’s worldwide sales offices and after-sale workshops are located in Colombia, Ghana, Nigeria, Russia, Spain and UAE.